Holidays have been and gone, we’re back in Xi’an and curing our burns we brought back amongst other souvenirs and great memories from the Philippines. We flew Air Korea, which meant we got to spend some time in South Korea (airport, but Korea nonetheless!) I was absolutely amazed by the amount of Russian at the Seoul airport – the airport even had signs in Russian to cater for the clientele. As it turns out, the Russian love the Far East – Busan, Hainan, Phuket etc. Trying some traditional Korean painting to pass time at the airport. After eating our bibimbap, which is a traditional Korean dish of vegetables, rice and numerous pickles, we boarded another flight and were on our way to Cebu – the second biggest city in the Philippines. David had been to Cebu once before to attend the wedding of one his best Zimbabwean friends back in 2011. 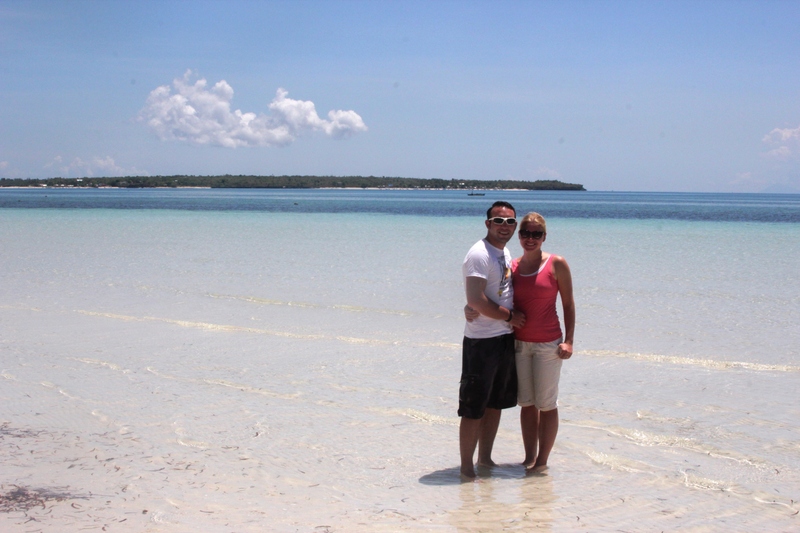 As Cebu is a big and very crowded place, we decided to travel further afield to Bantayan island. We took a bus at 4 am in the morning. After 4 hours of lovely air conditioning, free WiFi and beautiful views we arrived in a small port town of Hagnaya. From there we took a ferry to Bantayan, which took about 2 hours. We thought it would be a great idea to sit on the deck and enjoy the sun while all the (more clever) locals sat in the shade. You can guess what happened to us. 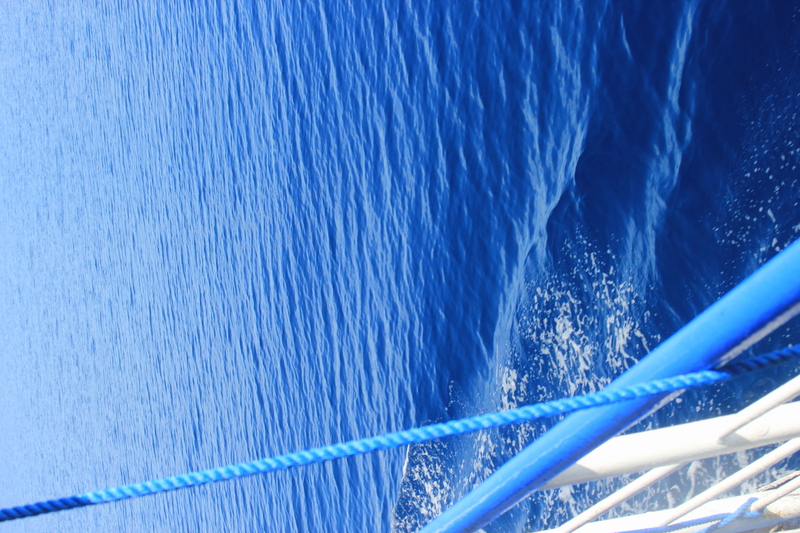 Water as seen from the ferry. 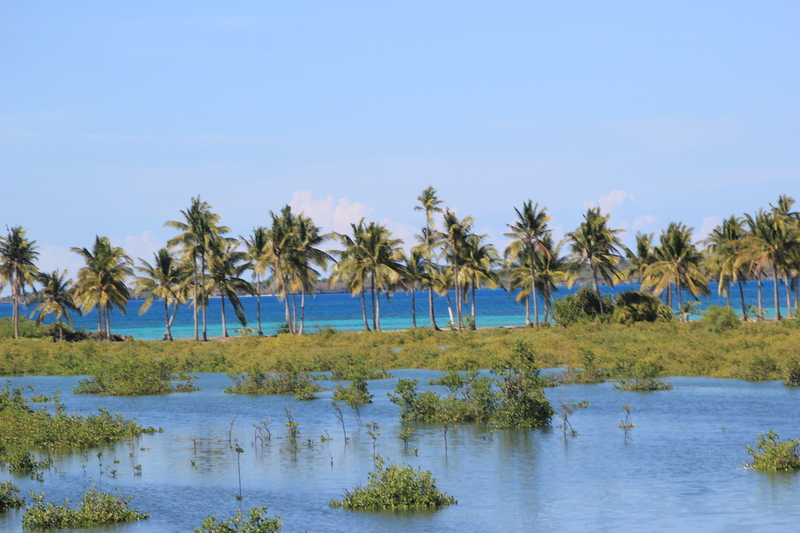 Bantayan is what you see on postcards and think these places don’t really exist. 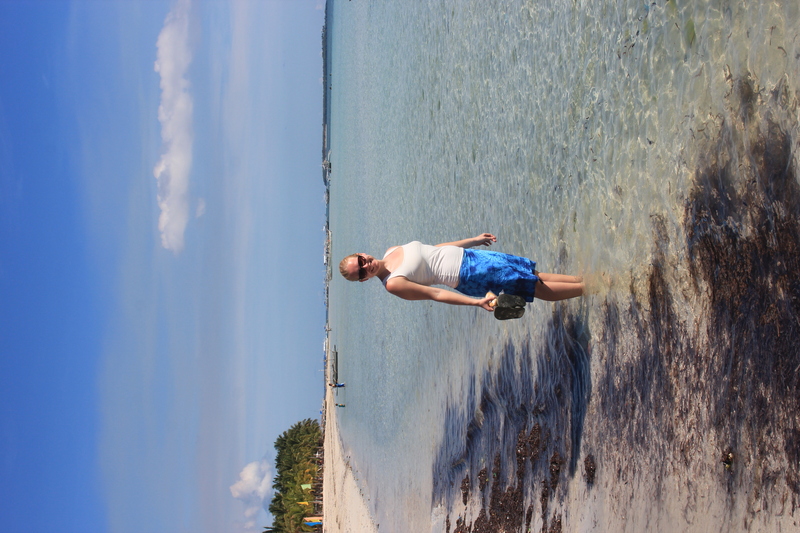 The Philippine Sea surrounding Bantayan is so clear and glimmers in a beautiful turquoise colour in the hot sun. 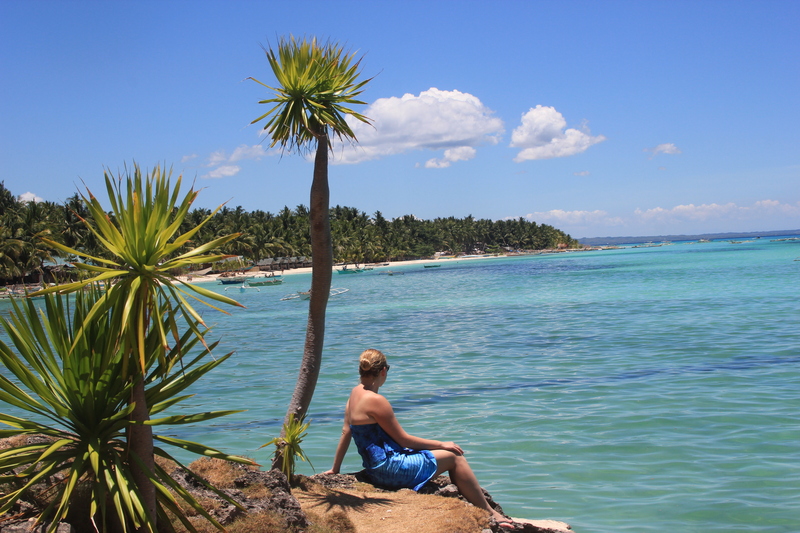 There are deserted beaches with white sand, palm trees stretching across the beach, local children playing in the water and people taking siestas in hammocks. Having said that though, the Spanish influence is pretty obvious too. The architecture, the huge presence of the Catholic church and names like Jesus Alvarez speak for themselves. We didn’t meet a single Spaniard. 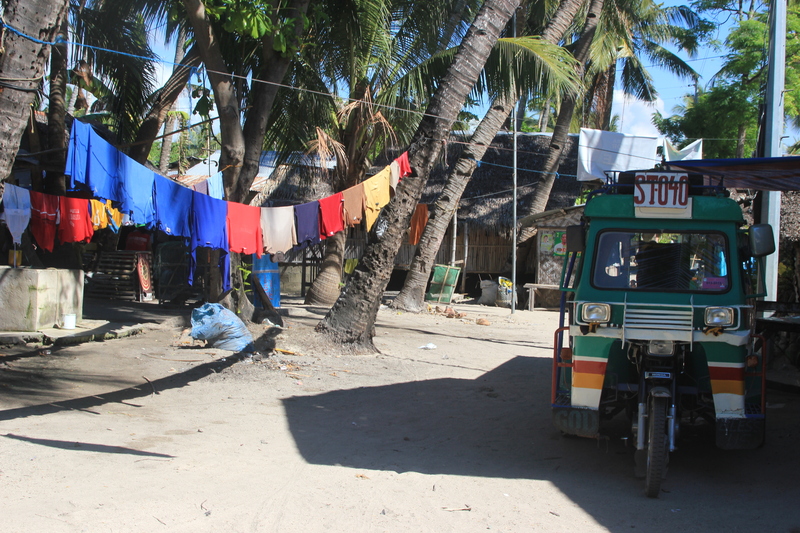 There are very few cars on Bantayan. The main means of getting around is by a moped or by a tricycle. We were met by many tricycle riders on arrival and decided to go with the first one. Our beach resort was about a 5 minute ride from the ferry terminal. After 5 minutes on the island I was sweating buckets and feeling really hot, it must have been about 37 degrees the whole time we were there. 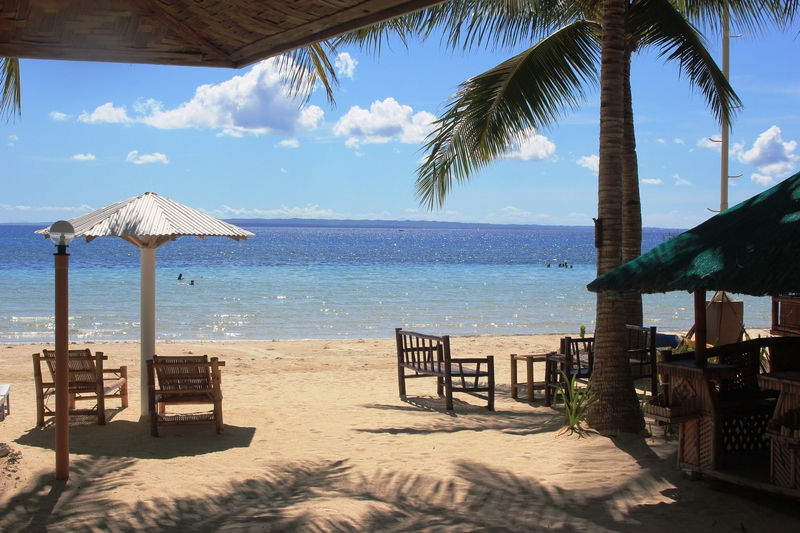 Our beach lodge was owned by a German-Filipino couple, of which there seemed to be a lot of. The lady of the house – Joy – was wonderful. She was extremely welcoming, helpful and really interested in us. 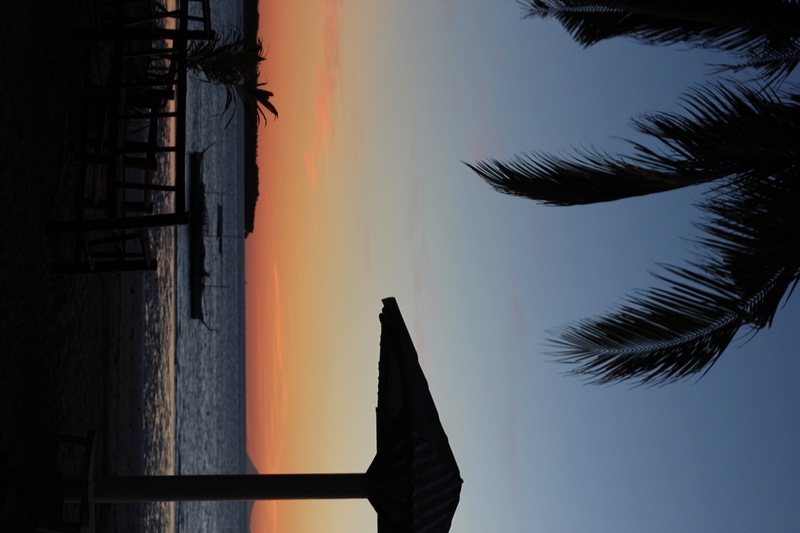 Our hut was facing the beach, about 10 metres from the water, surrounded by palm trees and white sand. Jealous, I hear you say? We spent the first day just admiring the beauty of the place and getting ourselves acquainted to the island and the closest town – Santa Fe. 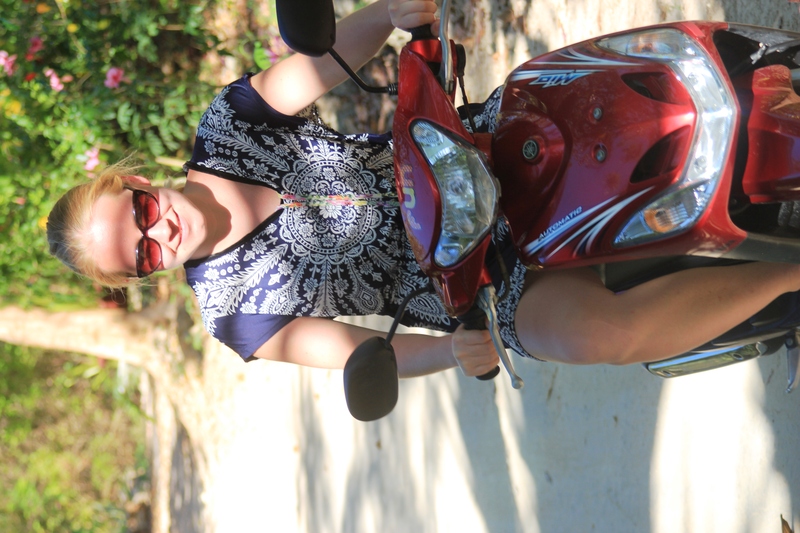 We rented a moped the next day, which is when the real fun started. David drove us around at first and we visited some natural caves and some more beaches on the island. Then came my turn to try and David never got to ride the moped again. I did crash it into someone’s flower bed once, but quickly recovered from that. What driving licence? My husband bought his and I don’t have one. 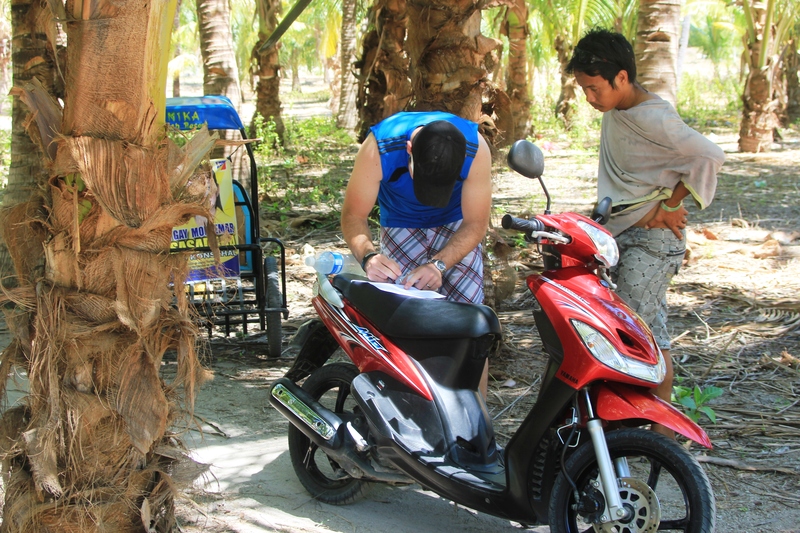 David signing the contract for our moped. We went exploring the island and ended up in some quite remote villages, where we were always met with waves and smiling faces. 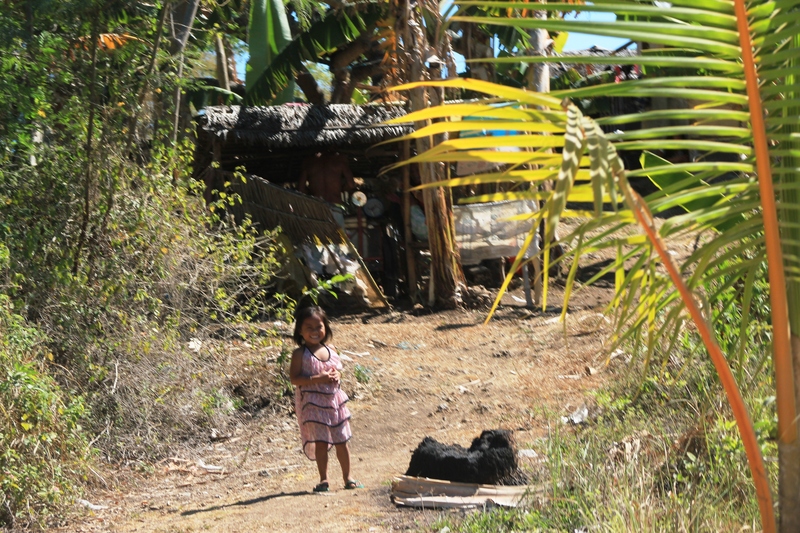 The living conditions in these villages are very basic – no running water, no sewage systems and often no electricity. Yet, every single person we met was happy. On our way to one of the said villages. I found the Filipinos in general some of the friendliest people I have ever met. They may be poor and live in very bad conditions, but they don’t complain, there was no begging whatsoever and they were genuinely interested in how we were doing. It was a huge change from having been in China for nearly 4 months now. We visited Virgin island on our last day, which is pretty special. The neighbours at our beach resort are fishermen and their son sometimes takes tourists around to earn some extra money, so he took us to the island for the day. We arrived quite early, so we were practically the only tourists there for a few hours before lots of boats started to arrive. We went snorkelling and saw some glorious fish, lots of starfish and I had my first encounter with a jellyfish after which I was too scared to go anywhere near the water. 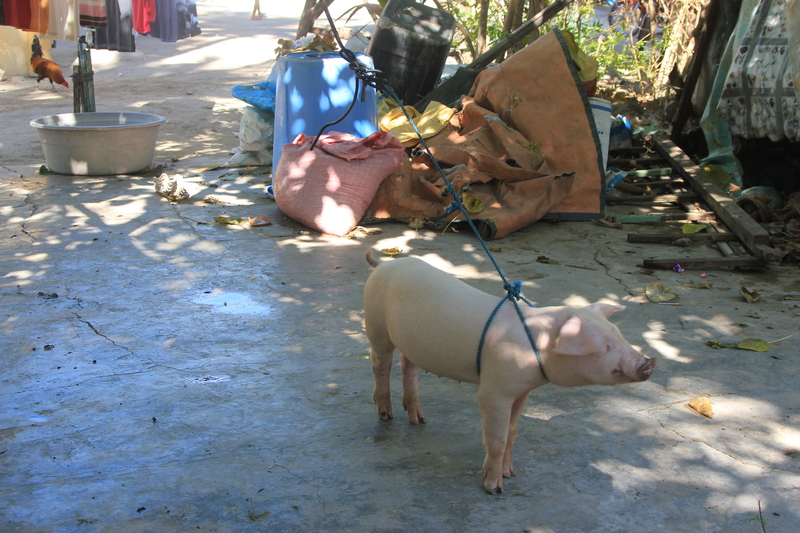 As it’s so hot on Bantayan, people’s body clocks work differently. We awoke with the sunrise around 5 most mornings. I took many early morning walks on the beach, collected some seashells and saw what the fishermen had caught. Not much happens during the day – it’s way too hot. People sleep in their hammocks and wait for the sun to go down. Sadly, with Filipinos there is always the issue of the Filipino wife. 99% of the tourists on the island were foreign guys with their Filipino wives. This is fine, of course. But again 99% of the time the Filipino wife was very young and beautiful and the foreign husband…..not so much. It’s difficult not to make stereotypical conclusions here. 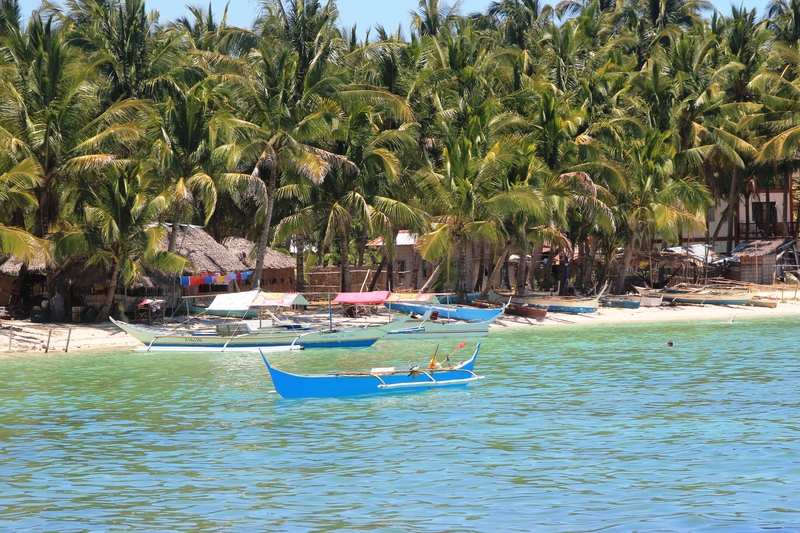 We spoke to some of the restaurant staff on Bantayan, who said they worked 10 hours a day, 7 days a week, because there is no other way to survive. Maybe opportunities are so few, that marrying a foreign guy sometimes truly is the only way out. The poverty I saw also astounded me. I thought I had seen it all in Zimbabwe, but this was a lot more different and a lot worse. The towns are so packed that people live in tiny little rooms, whole families together. Even the graveyards are so packed that they sometimes have to bury people on top of each other. The very dense population gives way for the slums, which in turn make for rubbish living conditions, which in turn make for a poor quality of life. 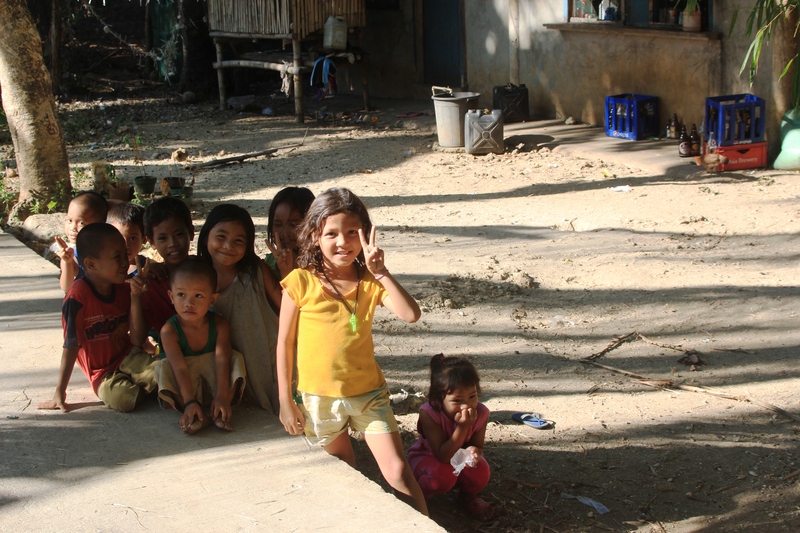 We saw very few old people, which could mean the life expectancy is very low in The Philippines. I am really looking forward to going back to The Philippines and exploring more of the beautiful country. I miss my moped. It’s been raining for two days. The pavements are very slippery due to the combination of rain, spit and other rubbish. Lots of things in our flat have stopped working recently. The boiler sometimes decides not to work. The toilet was broken for two days (this is not our fault, I promise – we have a common piping system, so anyone can block everyone’s toilets). 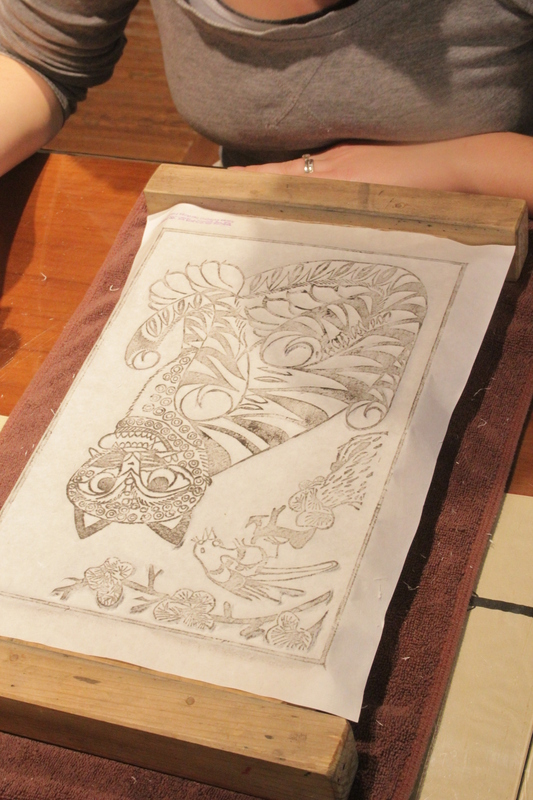 We are starting extra Chinese classes next week, so soon we will get much better. Bird flu seems to be under control. I am keeping away from eating chicken feet, just in case. Not that I ever eat them anyway. Apart from this, nothing huge has happened or is happening in the near future. We are planning a visit to the terracotta army finally, so I shall tell you all about it. Posted in Places, The PhilippinesTagged Bantayan, Cebu, China, Filipino, Santa Fe, The Philippines, Xi'anBookmark the permalink. Did I detect a bit of post holiday blues in the end of this post? Love these updates, keep them coming! Ya, the beach, clean air and palm trees don’t compare to the pollution and concrete jungle of Xi’an! Thanks, Jeremy. You should come and be here for real!